When you awake at 3:00am everything is a blur. The edges of your vision slip away to nothingness, your eyelids drop with every slip of the mind and your senses are numbed. Unless that is, you are stood at Qalqiliya checkpoint in the West Bank. Here your senses are heightened from the cooking meat, the brewing coffee and the mass of humanity. The harsh strip lighting rips through any thought of sleep and ensures you stay with the present, however much you and all around you wish to escape it. What cannot be so easily explained however are the emotions that sit so heavily on the pit of your stomach as you stand in the early hours counting people through the entrance of the checkpoint. Qalqiliya checkpoint is situated to the north of the city and in the first few hours of opening it will see thousands pass through its gates. On this particular morning I watch 3,000 bodies slip past me, all on their way to try and make a day’s living on the other side of the barrier. Mostly the faces of these men look to me with a registering smile but little else. I am not sure what I expect from my endless cheery “good mornings” but I certainly do not get it. On occasions I get nods, mutters and silent acknowledgments. I cannot, and do not blame them for this response. For them, it is another freezing morning where they have had to awake well before 3:00am to queue to get past a barrier that an occupying power has built across their land. For them, they have seen little improvements in condition or speed of transit since the international community started monitoring the checkpoint. My EAPPI colleagues and I provide invaluable data to the UN, but for them we are now part of the whole degrading process. I am shocked by the lack of humanity, but they are the victims of it. 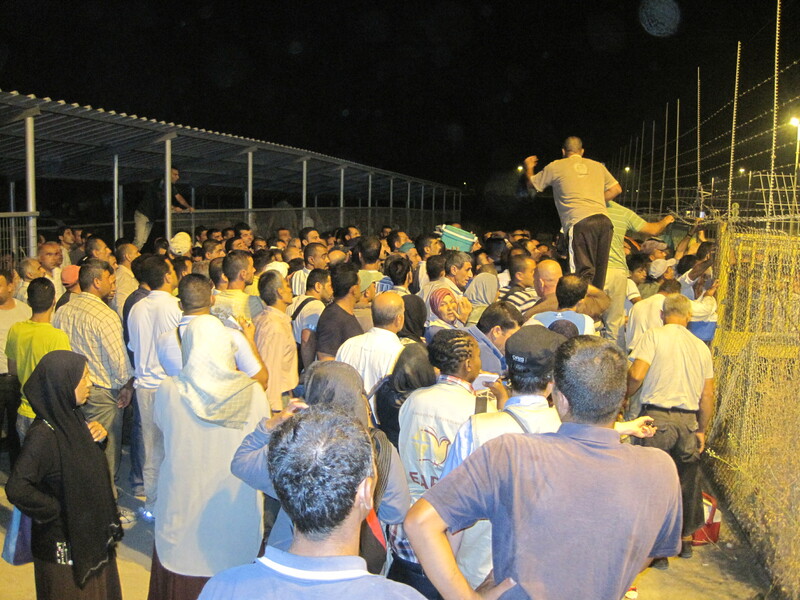 I am appalled by the humiliation of passing through the checkpoint but they have to endure it. I am saddened to the point of tears building behind my eyes by every one of them not being able to lift their gaze from the floor but it is their reality, not mine. Cutting into this reality is the continuous voice that is devoid of any sense of irony when it keeps demanding “Yallah yallah” move move. A never ending list of impossible demands reverberates from the PA system above our heads. They keep reminding anyone who is listening that they must move faster. How they expect people to do this is never elaborated upon. A faceless voice demanding the impossible. This is the reality of my first session monitoring Qalqiliya checkpoint. When you report on human rights violations and how International Humanitarian Law is being violated, the first rule is to show the victim with agency – the ability to influence and change the situation they find themselves in. Here, every aspect of life is controlled. Whether we are talking about access to land, water or food, or the ability to build, work, learn or get medical treatment. Everything is controlled, restricted and made unreliable. In light of this, all I can offer now are the harsh realities of passing through Qalqiliya checkpoint the best as I can recall them. As I stamp my feet in the bitter cold I try one last “Good Morning” to another body slipping past me. This time though he stops, looks at me, raises a wry smile, and responds “leish?”…. why? Why is it a good morning? For this I have no answer. Tomorrow I am getting up a few hours later to monitor an agricultural gate that opens before sunrise. At the same time, many of the same men will be starting the same humiliating regime all over again. Thanks for capturing the hopelessness of Qualqilya North. Great text, I’m sharing it. Say hi to all the Jayyousi friends from me! /Sara, Team 38. Pingback: Qalqiliya checkpoint and the impossible question – why? I was an EA in the SHH in the fall of 2011, and your post reminds me of bad mornings at Meitar checkpoint. While Meitar is better than Qalqilia by lots of measures, its still a lot of the same old story. Yes, I did feel like I was part of the grinding process the men (and occasional women) had to pass through, and I wondered why I was there. “Sabah al Kher” just didn’t seem all that helpful. Mostly I felt helpless. But there need to be witnesses to this, witnesses for the world, internationals who by their presence witness to the people that what they are going through is considered to be wrong by many people around the world, other than themselves. Your presence says to them, “you are not alone.” Thank you for being there and God bless you in your service. Great post. How do prayers work when the gates are so cramped? And how do the passes work – do they have to be back through the gates by a certain time the same day? I was not there for prayers (arrived just after) so not sure to be honest. I am sure it will come up at some point though and I will let you know when I know. You can have different passes. A lot of people leave on Sunday (the start of the week) and return on Thursday night for the weekend. Others do it daily.